John Dahlgren is a Psychologist and a member of the Swiss Psychologist Federation (FSP). Born in Stockholm, Sweden, he grew up close to the vast and untamed landscape of Scandinavia and became influenced at an early age by the Nordic sagas, fairytales and mythologies. This environment fired his imagination and inspired him, to later become a fiction/fantasy writer. He has studied creative and fiction writing at Oxford University where he earned high praise for his work. Dahlgren is mostly known for his Sagaria fantasy series. Besides his regular work, he is now engaged in several book projects, for both younger readers and adults. He’s also a script writer and composer. Dahlgren lives in Neuchâtel, Switzerland with his wife and two children. "Tides of Avarice" by John Dahlgren is a quirky, swashbuckling, original combination of pirates, treasure maps and lemmings. Sylvester Lemmington is our hero: a timid, serious lemming who works as a translator for the head archivist at the library. The love interest is Viola, a pretty, feisty lemmingess who merrily leads Sylvester into trouble, along with his treasure map. Add a missing father, Jasper, who took part in the last great lemming Exodus, from which mysteriously none returned many years ago, a whole host more slightly off-the-wall characters, plus of course an original plot, and you have a very entertaining, enjoyable book in your hands. There is plenty of skulduggery going on, and not just from the pirates. The lemmings and other animals share all our human characteristics, including the less wholesome ones so that there is a layer of social commentary buried in the humour. I read this with my ten year old - neither of us quite in the intended YA audience - but it is hard to say which of us enjoyed it more. I could pick up some of the humorous subtleties of the writing that he missed but he could clearly imagine every single scene going on in his own head. We were both hooked. Dahlgren, a Scandinavian by birth, has an incredible mastery of language and is a very, very clever, creative writer. The story twists and turns, with enough of the extreme and ridiculous to keep youngsters engrossed and adults chuckling. It is refreshing and ingenious – it’s brilliant! In The Tides of Avarice (A Sagaria Legend) by John Dahlgren, an unassuming librarian is tested by a dangerous adventure and possibly death. Sylvester Lemmington, a lemming, is a mild-mannered Junior Archivist and Translator of Ancient Tongues, living a peaceful life in Foxglove with his mother, Hortensia. When he and his girlfriend, Viola Pickleberry, rescue a ferret named Keelhaul Levantes from the river, Sylvester's peaceful life is no more. Levantes gives a treasure map to the lemming, warning him about the risk that comes with it before his last breath. Rescuing Levantes sets in motion a wild chain reaction of events; the first would be the arrival of Captain Terrigan Rustbane in Foxglove, a feared pirate in Sagaria. Set in a unique universe, lemmings, foxes, worgs (creatures that are uglier and nastier than trolls), ferrets, rats and many more fill the world of Sagaria. The pace of the well-structured and exciting plot is appropriately mellow in some parts and fast in others. This added to my enjoyment of the story, following Sylvester as he navigates through his adventure. Dahlgren gives readers a delightful cast of animal characters. I’m very fond of Viola, Sylvester’s exuberant sweetheart, and her tough mother, ‘Three Pins’ Daphne. These two left an impression on me through their individual traits. Readers will find the humorous but sometimes dark and dangerous antics that the characters get themselves into endearing. On the whole, I truly enjoyed this smart and exciting swashbuckling adventure, a great read for both young and adult readers. 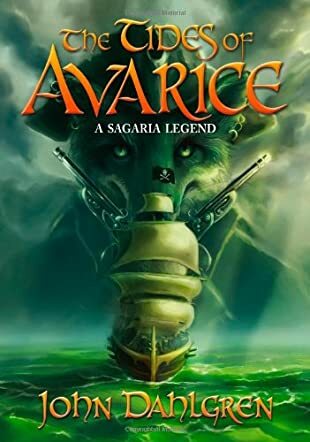 The Tides of Avarice: A Sagaria Legend by John Dahlgren is a fascinating story that will delight fans of animal tales. But it is even more fascinating to notice how familiar the characters are to humans. Sylvester Lemmington is a librarian and a lemming. He has read a lot in books of adventure and he has his own fantasies too, but now he will have to get down to action. When Viola (his sweetheart), her mom, and other friends of his are in grave danger, he has to save them. His hometown of Foxglove is also suffering from a vile and ruthless mayor, and he has to do something to save the city. But Sylvester is hunted for a treasure map by the cruelest captain that ever sailed the Seas of Sagaria, Cap'n Terrigan Rustbane. Can he get away from the pirate captain, save his town and the lives of people he cares about? You’ll have to read on to find out. First, the setting is painted in vivid descriptions and the reader immediately gets a powerful feel of what Darkwater looks like with its sluggish air, the smell, and the meanness of the inhabitants, including the children. A part of the town is described as “the dankest, dismalest, most corpse-littered part of Darkwater.” The writing is highly descriptive and tight, offering powerful images that literally hypnotize readers. It is action-packed and John Dahlgren knows how to make readers feel as though they are part of the drama. The action is intense and it doesn’t diminish at any point. Readers quickly get to love the characters, especially the narrator and his ebullient, compelling voice. The Tides of Avarice: A Sagaria Legend is the kind of adventure readers want to watch on screen. I loved everything about this book, from the exquisite writing, to the compelling, quirky characters, to the hypnotic plot, and the exciting setting. You can’t put it down once you start reading. The Tides of Avarice (A Sagaria Legend) by John Dahlgren is an animal action/adventure story that would appeal most to a mixed audience of tweens, teens, and young adults who enjoy adventure fiction where the main character is an animal. Sylvester Lemmington is a lemming and a librarian, with the title of Junior Archivist and Translator of Ancient Tongues, who is plagued by questions about what happened to the lemmings who set off for the edge of the Mighty Enormous Cliff and never came back. Young Sylvester’s life is in for a big change when, by mistake, he came to own the most sought after treasure map that ever existed, and he is now being hunted by a cruel pirate captain by the name of Terrigan Rustbane. Does Sylvester Lemmington have what it takes to go from a Junior Archivist and Translator of Ancient Tongues to an adventurer who can save his friends, family, and sweetheart? Move out of the way Paw Patrol, animal rescuers, and Pound Puppies, and make room for Sylvester Lemmington in The Tides of Avarice (A Sagaria Legend) by John Dahlgren. I personally found Sylvester Lemmington to be my favorite character and I really liked that he was not the traditional hero type with big muscles, a brash personality, and loads of strength. Instead, I liked that Sylvester Lemmington was an intelligent character with cunning, wit, and the ability to think on his feet. The fact that he was also an adorable lemming only added to his appeal as a character in my mind. The story itself was very well written and I loved how the author made each scene come alive in my mind through the use of descriptive language without adding too much detail. Overall, I really enjoyed reading this book and I hope the author decides to write a follow up novel soon! Sylvester Lemmington is a lemming and a librarian and this makes him one of those privileged with knowledge, because he reads a lot. He happens to possess a valuable map that leads to immense treasure. Now, a pirate lord, Cap'n Terrigan Rustbane, is after this map and will stop at nothing to get it. He is a ruthless thug and poses a great threat to the lemming. Sylvester’s sweetheart, her mother and other people are in danger and they need his help. And while the town is under duress from an ill-fated and egoistic mayor, Sylvester must save them all and save himself from the claws of the pirate. Does he have what it takes to accomplish such an arduous mission? The Tides of Avarice: A Sagaria Legend by John Dahlgren is an impeccable tale for fans of animal fantasy, a story that is every bit as hilarious as it is entertaining. This is one of the best books I have read about animal fantasy and I enjoyed it even more than Animal Farm. The writing is wonderful, filled with such powerful descriptions that conjure up clear images of the setting. The smells, the colors, the images and the social aspects of the environment are so beautifully portrayed that the reader will see everything unfolding before their eyes. The story is expertly plotted and written at an excellent pace. The characters are charming, quirky, and memorable. John Dahlgren’s The Tides of Avarice: A Sagaria Legend caught me by surprise and I couldn’t stop reading from the moment I opened it. Action-packed and mesmerizing! The Tides of Avarice by John Dahlgren follows lemming librarian Sylvester Lemmington who has spent his life reading about adventures, never expecting to embark on one of his own. The mayor of his beloved hometown of Foxglove is ruthless and has sinister plans to get rid of Sylvester by sending him on an Exodus, the same trip that caused his father to disappear years earlier. A daring adventure may lead him to his father, but it could also cost him the girl he loves, her mother, and his friends when they're captured by the pirate Cap'n Terrigan Rustbane. When a treasure map lands in his paws, he's led on a wild adventure he never imagined possible. The dialogue is fantastic with dialect, jargon, and an assortment of fun sayings that are humorous and broaden this world that John Dahlgren has brought to life. Each character is unique with quirks, flaws, a zest for life, and vivid enough to pull you into the adventure with them. There's a historical quality to the plot that mixes with a layer of lore and fantasy, with the talking animals so personified that it's easy to forget they're animals. The names are clever, ranging from the more down to earth Sylvester and Viola to the more unique Cheesefang and Hairbell. It's an emotional and fun read, perfect for those who love adventures, animals, pirates, sci-fi, and fantasy. The Tides of Avarice is a riveting adventure with talking animals, lots of danger, and pirates. A must-read you won't be able to put down! "The Tides of Avarice" is a mysteriously enthralling fantasy novel written by John Dahlgren. Sylvester Lemmington is a librarian who lives in the very safe community called Foxgrove. However, this community is made up of lemmings instead of humans. Sylvester craves for adventure and mystery in his life and sets out with his girlfriend, Viola Pickleberry, in search of villainous pirates and a grand treasure. They also hope to find Sylvester’s missing father who disappeared some years before in a supposed accident. Along their splendid journey, the two encounter the crazy pirate, Captain Rustbane, as well as Madame Zahnia, the voodoo priestess, on the seas to Sagaria. They must overcome great dangers, travel the fierce sea, and face evil competitors along their way. Will they find their coveted treasure or Sylvester’s father? You’ll have to read it to find out more! John Dahlgren must have an absolutely beautiful imagination to create such a unique fantasy masterpiece on paper! The chapters flow very smoothly and the reader can comprehend the wording easily. The plot is solid and brilliantly worked throughout. The cover of the book is captivating and colorful and catches the reader’s eye quickly. It is easy to pick up and difficult to put down. The characters in this novel are well-developed and it is delightful to watch them grow and develop. Who wouldn’t enjoy such phenomenal pirate satire and witty quarreling? With its exciting, fast-paced action and well-written dialogue between its characters, this wonderful novel will not disappoint you. The arrays of animals from beavers and foxes to ocelots take on a life of their own and appear as unique three dimensional characters. I found this novel to be thoroughly entertaining and outstanding! I can also easily imagine Dahlgren’s work being made into a major motion picture or a miniseries event. Well done John Dahlgren. This novel is astonishingly perfect for young adult readers as well as older adult readers. I anticipate GREAT things coming from this novelist and cannot wait for Dahlgren’s next novel in the series to come out. Sylvester Lemmington, Junior Archivist and Translator of Ancient Tongue, and obviously a lemming, works for the old and very wise lemming, Celadon. Sylvester's childhood friend and now his love is fellow lemming Viola. She likes to compete, to race, and Sylvester likes to read but they like each other a lot. One night while they are looking out over the Great Wet Without End, a wounded ferret crawls up out of the water. Sylvester and Viola take him to the town doctor where he dies. But before he dies, Keelhaul Levanter, as the ferret is known, tells Sylvester not to trust anyone. But whom should Sylvester meet next but the charming grey fox who calls himself Robin Fourfeathers? Actually the fox is the notorious pirate Capt'n Terrigan Rustbane who is also called Deathflash, Doomslayer and Warhammer. Capt'n Rustbane commands the pirate ship Shadeblaze and has a crew of racoons, rats, bobcats, weasels and skunks who help him search after the Zindars' treasure. Will Sylvester, V! iola, and her mother Mrs. Pickleberry survive the onslaught of these deadly cutthroats and find this long-hidden treasure? "Tides of Avarice" is a well-written and well-edited animal fantasy that readers of all ages will enjoy. Sylvester, Viola, Capt'n Rustbane, Mrs. Pickleberry and her bat are delightful creations as are the colorful Cheesebang, Bellowguts, Gasbag, Bladderbulge the ship's cook, Pimplebrains the beaver and the entire cast of mostly animal characters. The plot follows the traditional travels afar and then back home for which science fiction novels are noted. Madame Zahnia the mouse mystic tells Sylvester on page 280 that "the path is seldom the one you'd like it to be" when talking of the future and his quest for the Zindars' treasure. However, readers would do well to follow the path that leads them to read this first-rate animal fantasy. Sylvester and Viola get caught up in a dilemma, taken aboard a pirate ship and are under threats of all sorts of cruel and deadly happenings if they don't reveal the source of the hidden treasure but they know if they do that, that will be the end of them. Sylvester holds the third part of a map that will reveal the lost treasure chest, or at least that is what Captain Adamite thinks and when he is murdered, Captain Rustbane renews the threats. (Who do you think killed Captain Adamite?) While on shore at a very revolting, dirty and just plain nasty pub, The Monkey's Curse, Sylvester and Viola meet and are rescued from certain death by a mouse named Rasco who proved to be a wonderful and helpful friend. This book, "A Tide of Averace", if full of adventure, frightful happenings and death deifying murder attempts, and should be of great interest to the reader. I hate to have to tell the "young adults" that this is a great book for adults too, even "older adults". "The Tides of Avarice" is quite a tail (oh, I meant to say 'tale'). I said, tail, because almost all the characters had tails as they were animals, lemmings, fox, beaver ocelot, and so on. Our hero, Sylvester, and heroine, Viola, are lemmings and most of the others are down and dirty, filthy murdering pirates. So it makes quite an interesting and fascinating story with lots of action and it is rather humorous also. A really, really good read! Sylvester Lemmington as a slightly timid Junior Archivist and Translator of Ancient Tongues is an unlikely hero in any adventure — all the more so being a lemming in the town of Foxglove where periodically large numbers of citizens leave on The Great Exodus at the Mighty Enormous Cliff. But that doesn’t stop him when his quiet bookish life got disrupted upon receiving a portion of a map thrust upon him by a dying ferret. Pirates arrive hunting the map and the first thing Sylvester knows is that he is aboard the pirate ship Shadeblaze with his secret love, Viola Pickleberry, and her acid-tongued mother. The three lemmings embark, however unwillingly, on a series of high risk adventures as Rustbane, the pirate captain, tries to locate the treasure to be found from the map and they try to stay alive. Along the way they encounter such marvelous characters as Madame Zahnia, a voodoo priestess mouse, and a treacherous ocelot named Jeopord. "The Tides of Avarice" by John Dahlgren is a marvelous book that is an adventure, a romance, a fantasy and an all-around good read. Parts are laugh-out-loud funny. The plot is complex and satisfying and the language smooth and readable, even when the characters are using dialects. Particularly interesting and enjoyable is the way Mr. Dahlgren has been able to blend the animal attributes with human psychology into a panorama of interesting characters. "The Tides of Avarice" may be listed as a young adult volume, but adults of any age will find it fascinating. I highly recommend it.